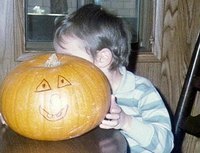 Searching for that ideal pumpkin to carve the annual Halloween Jack-o-lantern is a traditional event for many people, especially children. When Halloween is over, there is pumpkin pie for Thanksgiving, or special holiday breads and cookies made from pumpkin. Not everyone gets their pumpkin from the produce stand or grocery store. Some gardeners grow their own pumpkins each year, using seeds from a previous crop. In some ways, pumpkins are so easy to plant, that if you were to smash a pumpkin in fertile soil, the seeds could take root and bring forth a new crop. Schedule planting after the danger of frost is over. The soil should be warm, as pumpkin seeds will not germinate in cold soil. Consider the soil. Soil should not be wet or poorly aerated. Pumpkins will grow in most types of soil, of average fertility. Prepare rows of mounds. For vining pumpkins, each mound should take up 50 to 100 square feet, with about six feet between mounds. Space the rows 10 to 15 feet apart. For semibush pumpkins, space the mounds four feet apart, with eight feet between the rows. Plant four to five pumpkin seeds in each mound, at about one inch deep. Allow soil to dry out between watering. Thin each mound to the healthiest two or three plants, after the plants are established. Plant on the edge of the garden to give the pumpkins room to spread out.